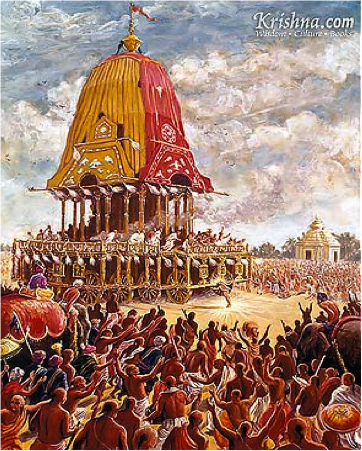 Ratha Yatra is an extraordinary chariot festival for Lord Krishna and His devotees dating back thousands of years originating in Jagannatha Puri. During the festival devotees throng to pull the ropes of the chariot and have the merciful glance of Jaganatha, Baladeva and Subhadra. In His time on this Earth, Krishna grew up in Vrindavana, and had great loving friendships there with all the residents, including the cowherd boys and girls. When Krishna grew up, He became a King and moved away from His childhood friends. After many years the residents of Vrindavana came to see Him. But He seemed so different to the mischievous cowherd boy they all knew and loved. So they kidnapped Him and tried to bring Him back to Vrindavana on a chariot. Being with Krishna like this they felt simultaneous loving emotions of closeness and separation. The Ratha Yatra festival is a modern expression of this pastime.